Common sense moment – it’s generally regarded as bad form to consume alcohol prior to doing anything that requires good cognitive skills. Driving obviously comes to mind. Making important decisions, such as considering a major purchase, would also be a time to be alcohol-free. As our hero Jin discovers in Game Atelier’s new platforming adventure, Monster Boy and the Cursed Kingdom, we can also add “using magic” to that list of things one should do without the influence of potent potables. After Jin’s uncle gets a hold of some of the king’s “private stash”, he uses a magic wand to turn all the residents of Monster World into anthropomorphic animals, and changes his own nephews into a miniature flying dragon and, in Jin’s case, a one-eyed pig. The similarities between Monster Boy and 2017’s hit remaster Wonder Boy: The Dragon’s Trap are pretty clear, and they are 100% intentional. 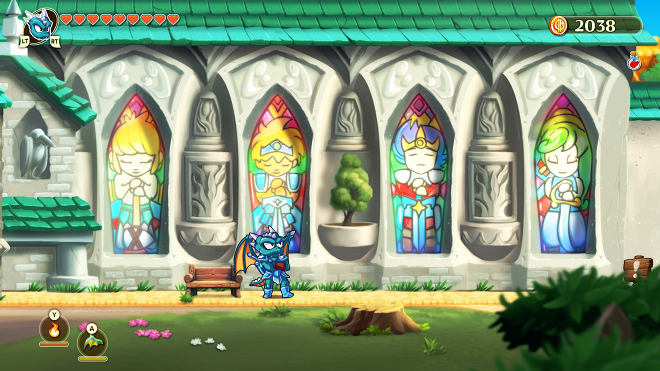 Game Atelier partnered with Ryuichi Nishizawa, the creator of the Wonder Boy character and franchise, to develop The Cursed Kingdom, just as Lizardcube had done for The Dragon’s Trap. However, The Cursed Kingdom is a full-on sequel, where players guide their shape-shifting protagonist around an immense Metroidvania-style map in order to set right all the shenanigans. A feast for the senses – Monster Boy is lavishly drawn, with beautiful backgrounds and well-animated characters and enemies. The color palette changes from sunny beaches and lush forests to dark caverns and regal celestial towers. Bosses are huge, screen-filling affairs that challenge your various animal forms. Those forms are charming and fun to watch, and each has their own unique idle animations. The ears are just as welcome to the party, thanks to an excellent orchestral soundtrack prepared by some of Japan’s greatest gaming composers, such as Sega favorite Yuzo Koshiro and Dark Souls maestro Motoi Sakuraba. Platforming excellence – The Wonder Boy franchise has always been about the player’s jumping skills, but it’s never really been a hop-and-bop à la Mario and Sonic. Instead, it focuses on making leaps of faith and exploring hitherto unknown areas, leaving monster-slaying to your character’s arsenal of weapons. Player controls are sharp and, to a degree, customizable. For instance, the pig’s magic selection can be modified in the settings to either cycle through the available spells using the controller’s bumpers or using those bumpers to open a selection wheel. Animal forms can be changed in a similar manner with the triggers, but there’s no need to get into the settings for this part: tapping the trigger will select the next one in line, while holding it brings up a separate selection wheel. Satisfying puzzling – Monster Boy throws some challenging mazes at players, and while some may prompt you to throw your controller across the room, rest assured that they are solvable, and that Jin has the tools needed to do it. If he doesn’t, keep exploring the area to find the key collectible needed to advance. Items from shops, such as new weapons and boots, may make things easier but it’s very rare when such things are the only obstacle to progression. By keeping that knowledge in the back of their heads, players will enjoy a great sense of satisfaction when new sections are opened to them. Completionists welcome – For those who tackle these kinds of games with the intention of finding absolutely everything there is to find, Monster Boy has just what you need. The game differs from most Metroidvanias in that there isn’t all that much back-tracking unless you’re after a specific pickup, like additional magic or an extra life heart. Still, as players explore the vast game map, they will likely see areas that look just out of reach with their current form that are screaming for someone to find them later on after a new animal form is unlocked or a new item is discovered. 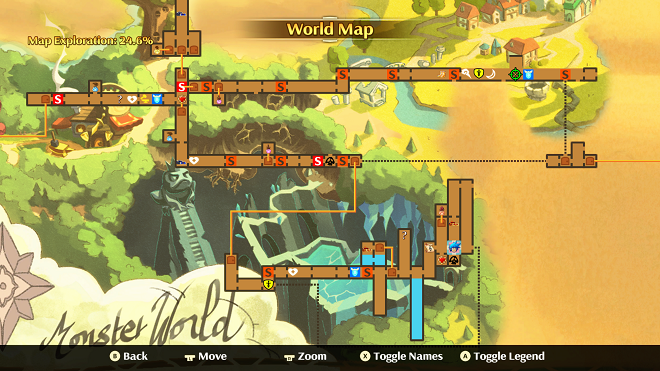 Fortunately, the game map is rapidly called up using the View button and features loads of information for would-be perfectionists. Plus, a particular weapon players can discover during their adventure will make it significantly easier to “pause” the main story to track something down and return to the same place. Respects its elders – Sega has deemed Monster Boy an official part of the Wonder Boy canon. One of the earliest callbacks in this game is your first animal form, which greatly resembles the shopkeeper pig found in The Dragon’s Trap. This pig sports a cosmetic eyepatch (watch his idle animation) and has a nose for secrets, to say nothing of his magic skills. Snakes were common early foes in the Wonder Boy titles, but there aren’t as many here as you now can transform into one, allowing you to sneak into places more easily and even ascend grassy walls. Other subtle and not-so-subtle references appear throughout the game, and all properly honor the franchise. 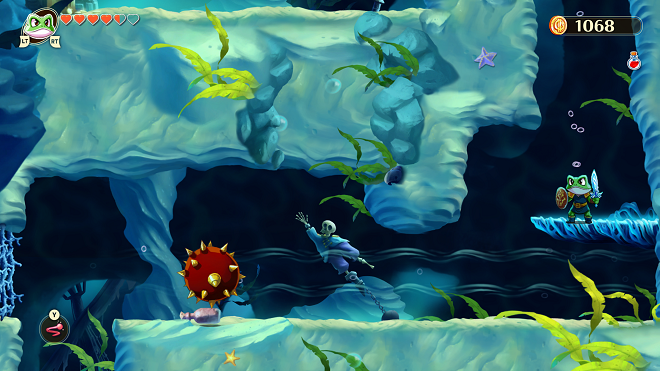 Save system – Metroidvanias have plenty of places where you can save your game, and Monster Boy brings three types of save locations to the table. The most common is a simple platform that serves as a quickie checkpoint. In fact, you may well dash into one when you least expect it upon entering a new area. Appearing less frequently is a shrine that will save the game and restore your character to full health at no charge. Instead of shrines, some areas include inns, which restore your health for a modest fee, save your game and sell the must-have elixirs that revive your character automatically at death. Your game will also save automatically from time to time, notably when major items are collected. Lastly, while not an auto-save in the pure sense, most puzzles will stay solved even if your character dies and you haven’t saved recently. Upon death, the player is returned to the last save point they touched, with all cash and items intact. Even though the platforming genre has never really fallen out of popularity, it has enjoyed a resurgence of late thanks to games like Ori and the Blind Forest, Super Meat Boy and Celeste. 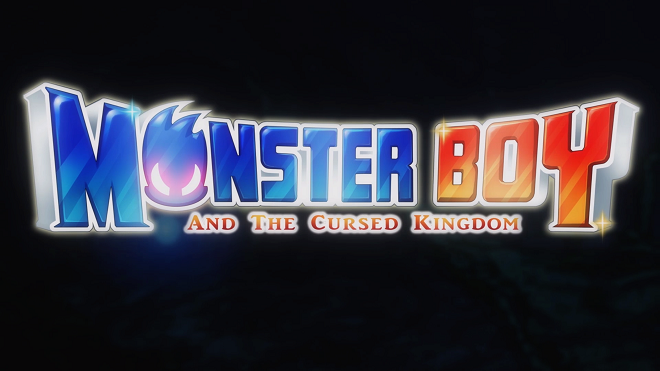 Monster Boy and the Cursed Kingdom should definitely be mentioned alongside those titles, thanks to its exceptional controls and presentation. 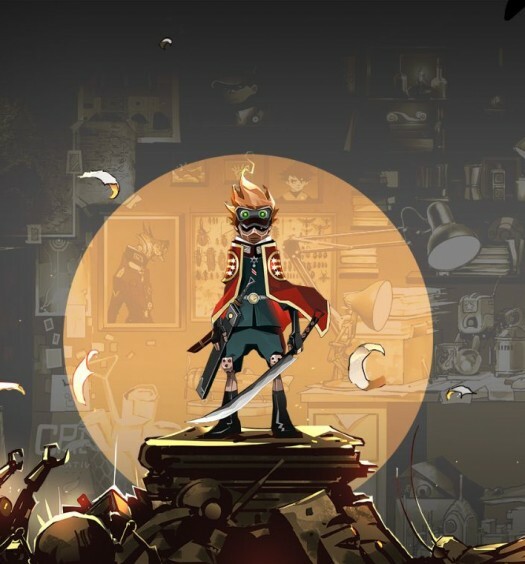 The game is both playful and challenging, encouraging you to overcome the obstacles before you and keep the story moving. The franchise may have been overshadowed back in the day, but Monster Boy deserves to be up in the rarefied air primarily populated by Italian plumbers with a fondness for the color red. 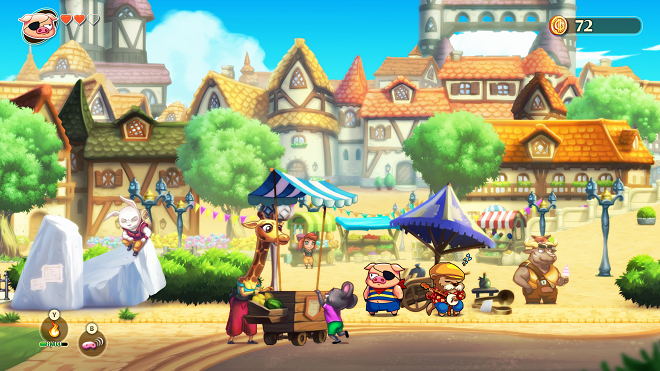 Monster Boy and the Cursed Kingdom was developed by Game Atelier and published by FDG Entertainment. It was released on December 4, 2018 for $39.99. The author was provided a review copy of the game.